Madd Hatters is a full service casino, dining and bar. Make your stay in Glendive an enjoyable experience by joining us for a meal and a beverage. We have a menu for the little 'guys' too! 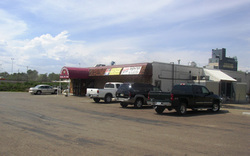 Directions: Madd Hatters Pub is located on Towne Street on the west side of Glendive. We are directly across from American Ford and adjacent to Robin's Mobile and the Greyhound Bus Depot on the major thoroughfare into Glendive.